Property Details: 4 Bedroom, 4.5 Bathroom Property with approx. 2520 square feet. 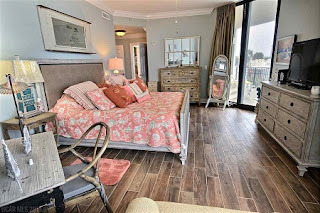 Perdido Key condo for sale at La Belle Maison. One of the area's most exclusive gulf front developments! Gorgeous French Mediterranean Architecture; gated, low density development with only 14 luxury units; coded entry into building; rent restricted to one year minimum rentals; gulf side pool and hot tub; boardwalk to the beach; large sun deck with pavers; sauna; steam room; fitness room; gated development; covered parking with exterior storage; climate controlled storage for each unit on ground level; two high speed elevators; solid poured in place concrete construction with wind rated windows and doors; secured, coded elevator entry to floor. Unit features: 10' +/- ceilings; oversized great room with dining area, large kitchen and island, wet bar, and large living room space; oversized gulf side deck; floor to ceiling windows and doors throughout; solid core interior doors; extra insulation in all walls; oversized master suite with large master bathroom; travertine slabs in master bath; granite counter tops in kitchen; stainless steel appliances; custom designer cabinetry; gulf views from two bedrooms; gorgeous, unobstructed direct gulf views and eastern views from unit; travertine flooring; new tile flooring in bedrooms; 2 A/C units and 2 hot water heaters; 4 decks; each bedroom has a private bath; and so much more! You will love the lifestyle at La Belle Maison! Oversized deck is set up like an outdoor living room; plantation shutters in living room and two bedrooms; custom drapes in other bedrooms.